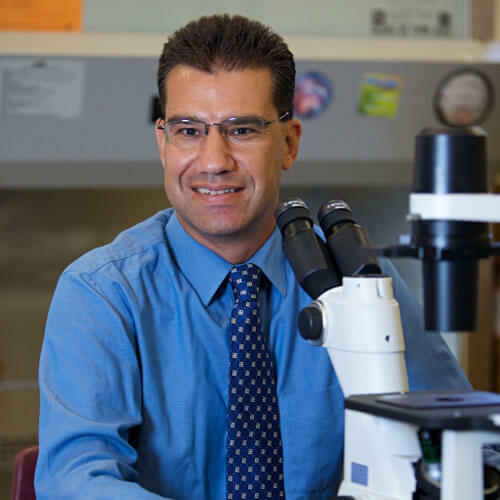 Dr. Palladino’s laboratory studies genes and proteins involved in cellular and molecular responses to impaired blood flow and oxygen levels in the testes and how oxygen-related clinical problems can result in impaired fertility or infertility. His laboratory conducts research on genes involved in protecting male reproductive organs from bacterial infections. Dr. Palladino has published many peer-reviewed papers in both research and education journals. Dr. Palladino is the co-author of Introduction to Biotechnology, a textbook that is currently used at over 100 institutions throughout the United States and Canada as well as the United Kingdom, Australia, Germany, India, New Zealand, Pakistan, Singapore, and China. Now in its third edition, Introduction to Biotechnology has been translated into Chinese, German, Korean, Spanish, and Taiwanese and is the leading textbook worldwide in undergraduate biotechnology education. Dr. Palladino is part of the co-authorship team of W.S. Klug, M.R. Cummings, C.A. Spencer, and M. A. Palladino for two leading textbooks in genetics, Concepts of Genetics, 10e and Essentials of Genetics, 8e. Collectively these publications have helped educate over 500,000 students worldwide. Dr. Palladino received his PhD in Anatomy and Cell Biology from the University of Virginia in 1994 and has taught at Monmouth since 1999.